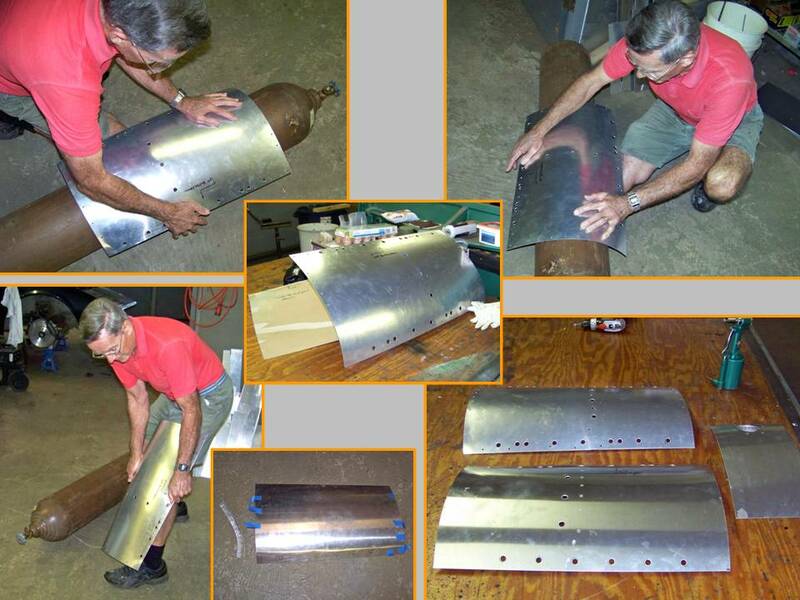 On the Fuselage Part 4 web page you saw the progress we made on the fuselage skin panels and on the bulkheads that shape the fuselage. You will see more of that progress on this web page. 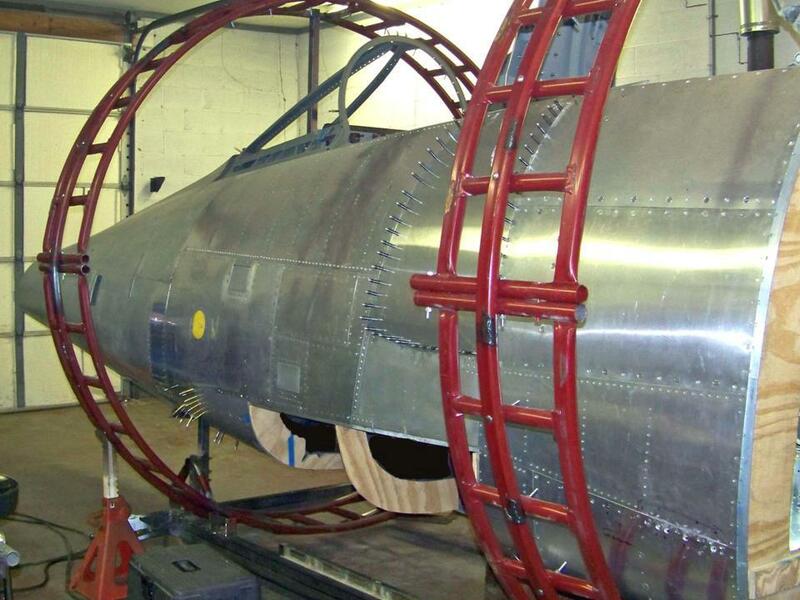 Unfortunately, the joined fuselage section was over 20' long and weighed far too much to let us use the same rotation structure that had worked so well on the forward section. 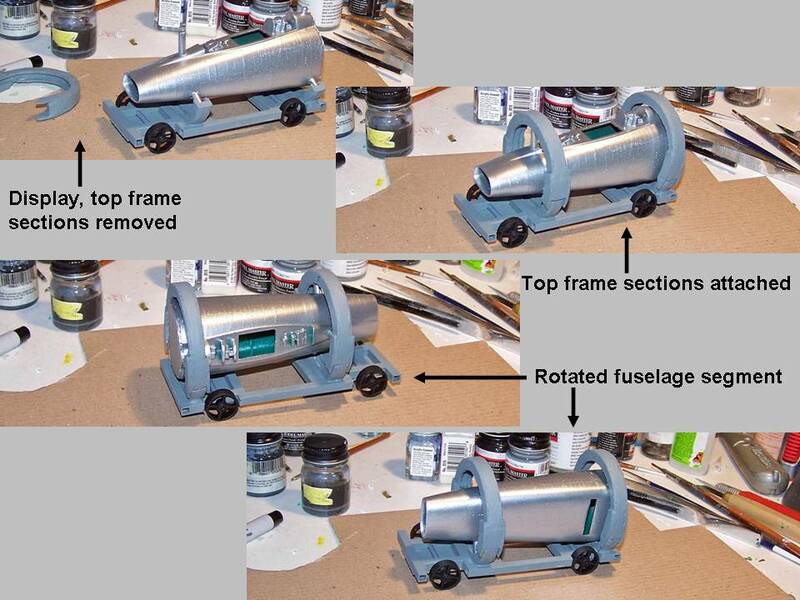 I spent a lot of time designing a rotating cage and even built a model of it to demonstrate its operation. The model worked fine, but it required some refinements. 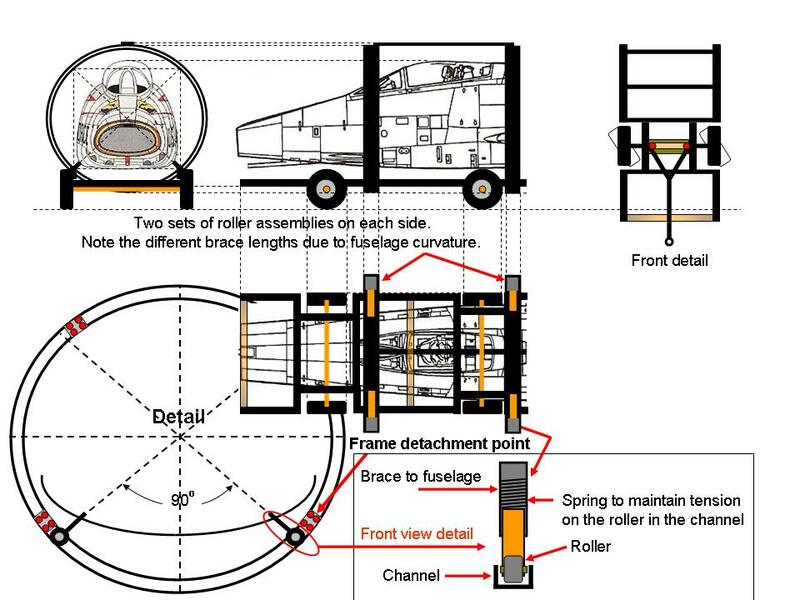 Figure 1, cell 01 shows the initial rotating frame design. 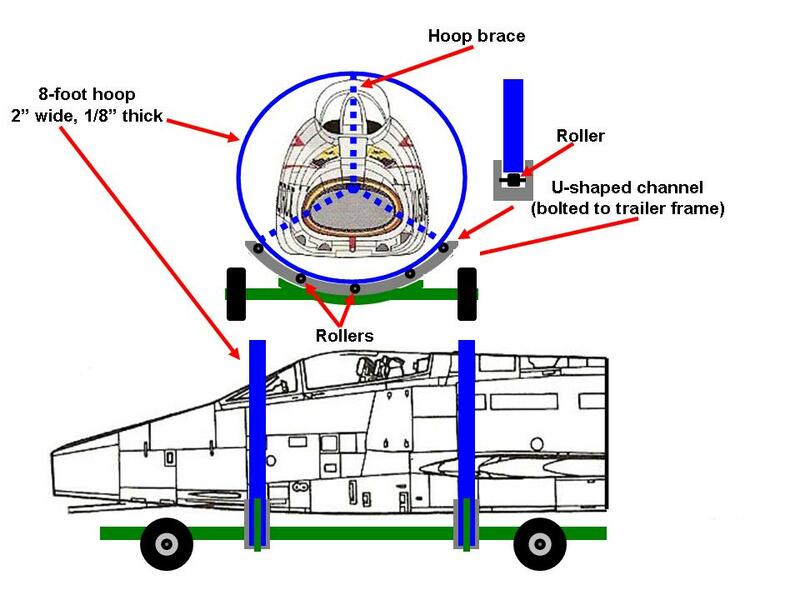 Basically, my design required a set of U-shaped steel hoops to be built into the trailer frame. 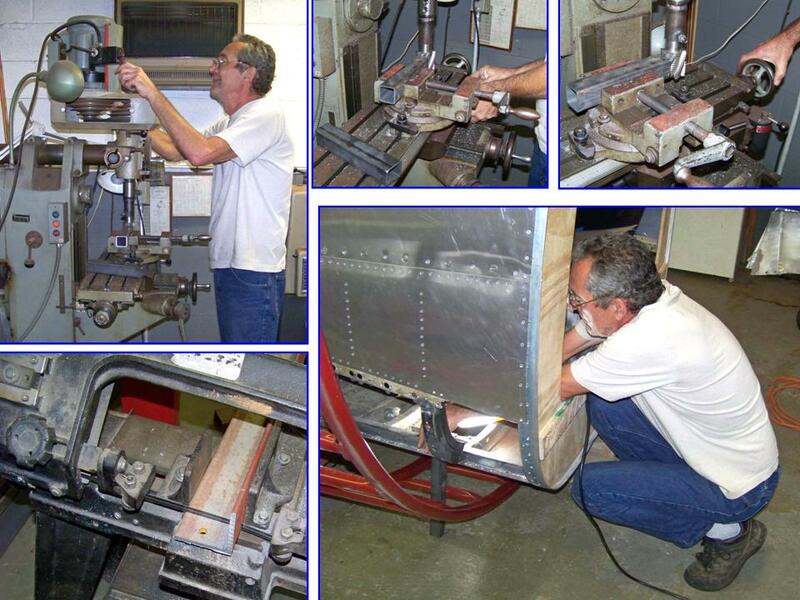 The fuselage would have three 2" box steel supports, placed evenly at 120 degrees to distribute the weight evenly. Each support would have spring-loaded steel roller at its end and the steel rollers would fit into the channels formed by the U-shaped steel frame. Cell 02 shows the test model, which worked fine. As usual, Steve's long record of hands-on engineering experience produced a better solution. 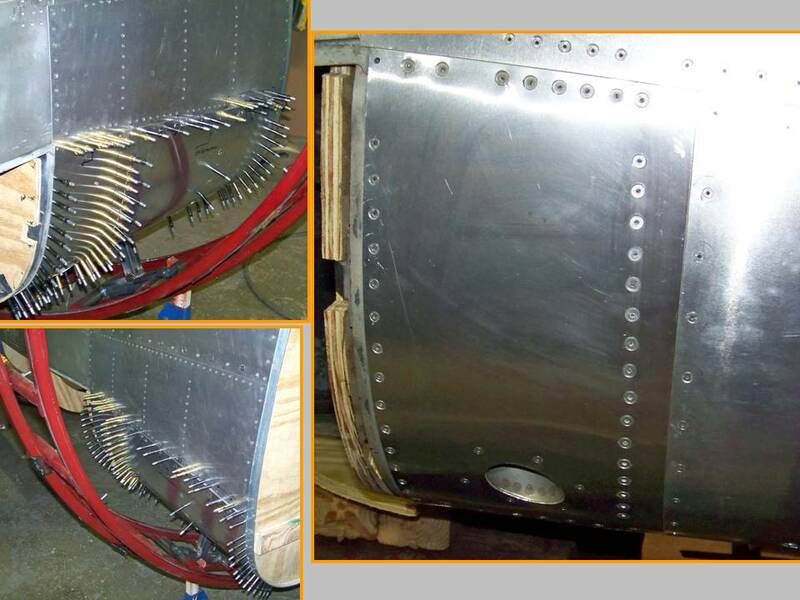 He suggested a modification of the initial design to attach the hoops to the fuselage frame and then to let these hoops rotate in a steel cradle. Bingo ... a stronger and more stable solution. Cell 03 shows the modified design. Steve proceeded to cut the lower section from each of the feeders, thus leaving a set of circular frames. 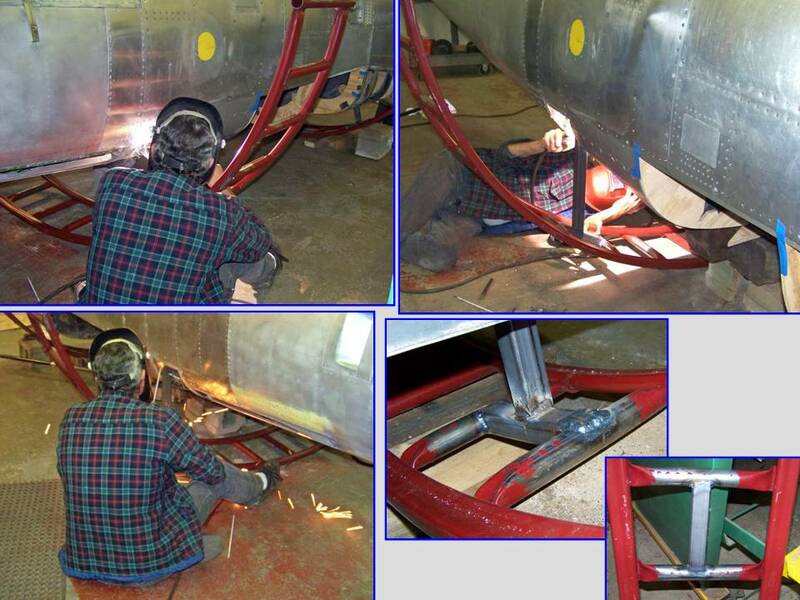 Given the construction of the feeders, those lower sections resembled a ladder curved into a perfect 8-foot circle. 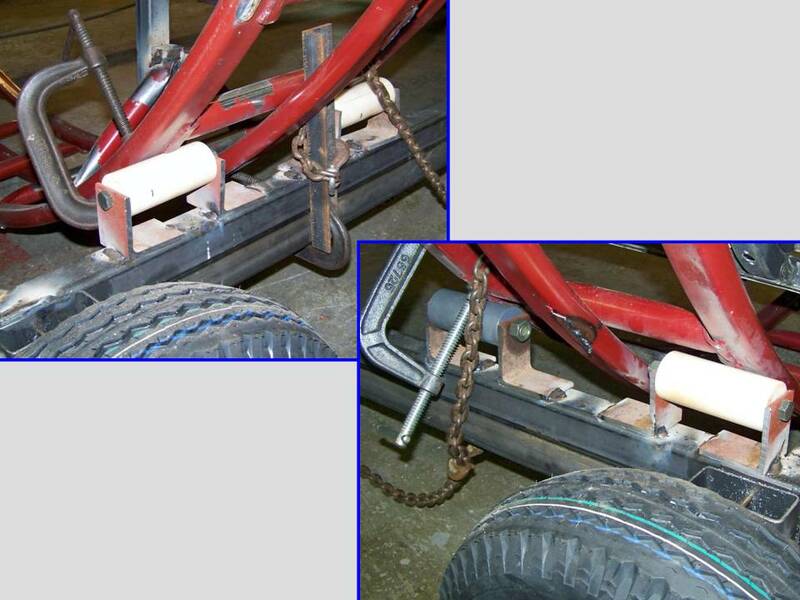 Therefore, we wound up with a wider-based -- and, therefore, more stable -- frame than the modified design showed. 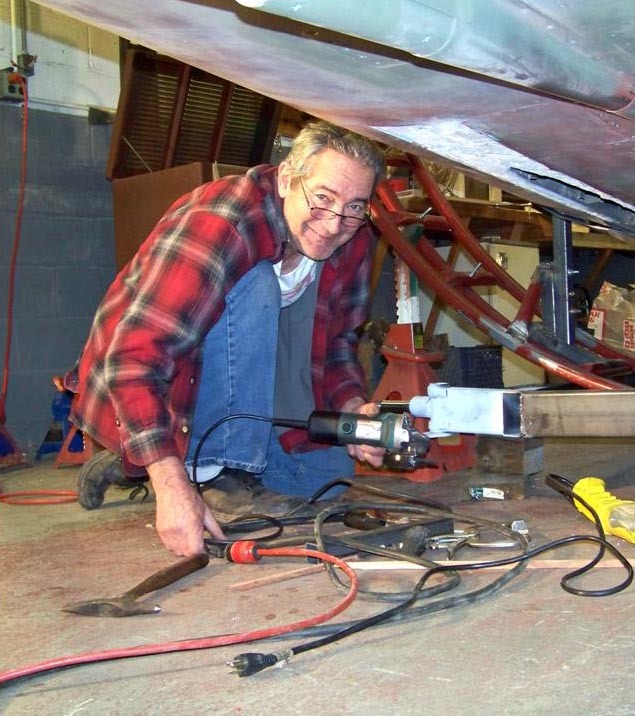 Steve also cut the outside steel hoop from the feeder, to be bolted into the center of the "ladders" ... thereby making the frame even stronger. 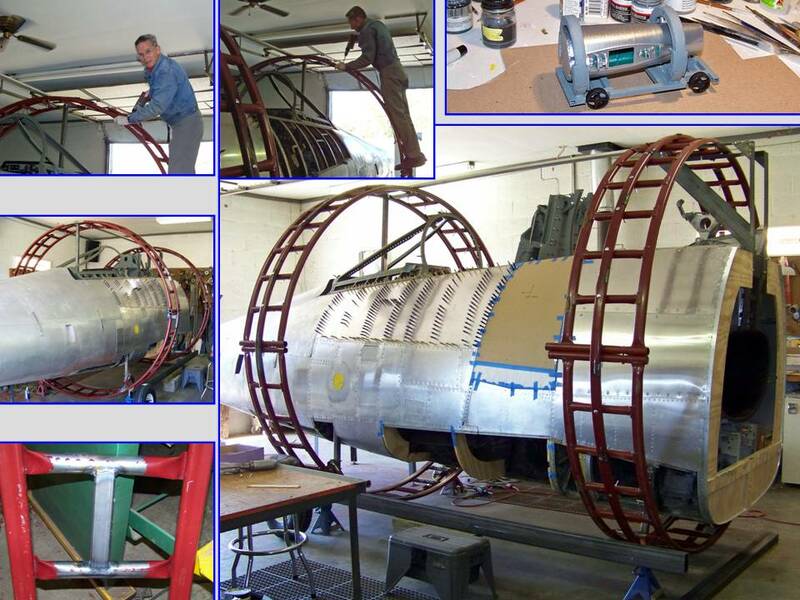 Figure 2, cells 01 and 02, show Steve making and then installing the rotating cage components and the fuselage supports. 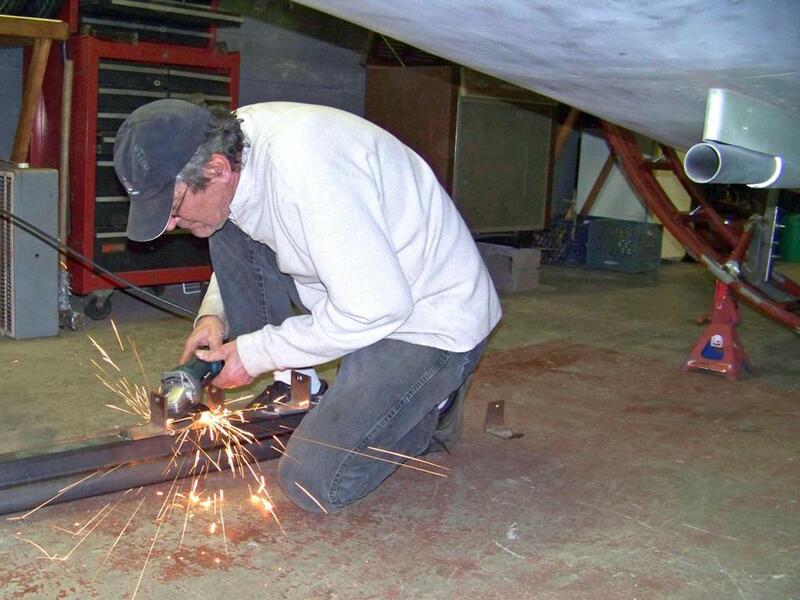 Note the plywood fuselage bulkhead and other fuselage frame components ... Steve managed to do all the welding without scorching anything. Cell 03 shows me working on the roll cage and, more important, it shows the completed rotor frame part of the roll cage. Actually, those "vents" are not vents at all. Instead, they are the ejection chutes for the 20mm shell cases. These chutes hook into the back side of the gun breach and when the gun is fired, the chamber rotates and ejects the brass overboard through this chute. The links are fed into a bin that is located just aft of this shell case ejection panel. Yep, that was one of the downfalls of the undersized chutes. Pilots were instructed to fire in short bursts, like 10 rounds at a whack. If you held the trigger down for a long burst, it would jam the guns or the casings would eject into the gun bay and blow the door off. I have seen both happen in 'Nam. It's a scary situation either way. 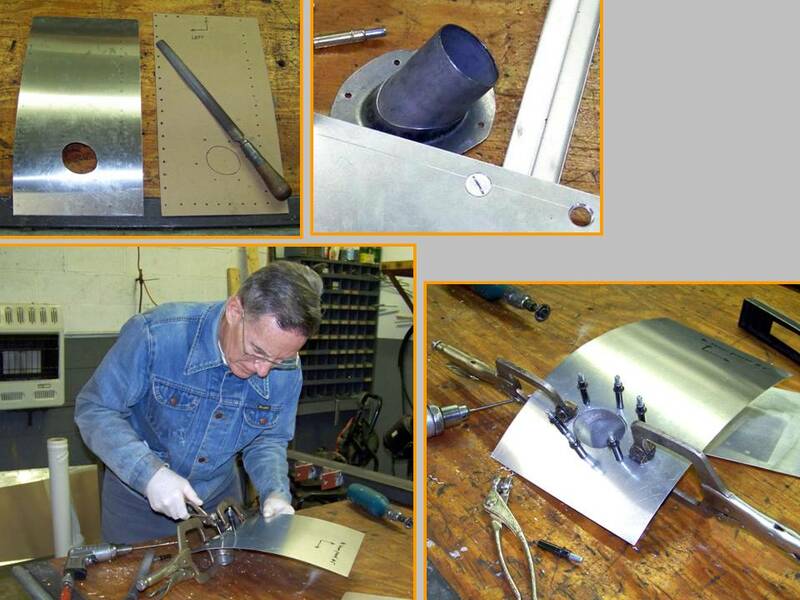 Figure 5, cell 01 shows the basic work required to make the ejection tube and the panel that contained it. Cell 02 shows the completed assembly. 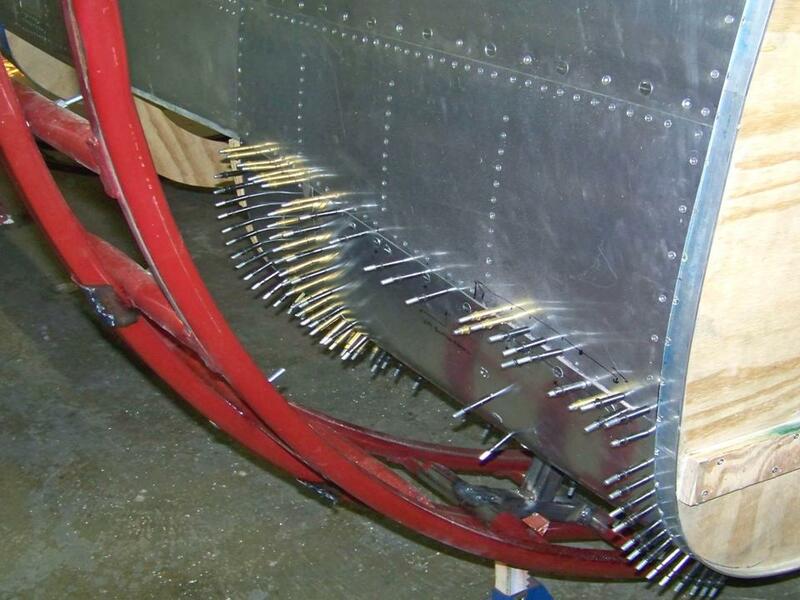 Note that I have used pop rivets, so the center of each rivet head shows a small hole. That hole will be filled in later, after which it will be sanded smooth and painted. The result will be a rivet head that looks just like the original. Next, it was time to work on the ammo door panel. I had already completed the frame to match the tracing done by Pete Felts. 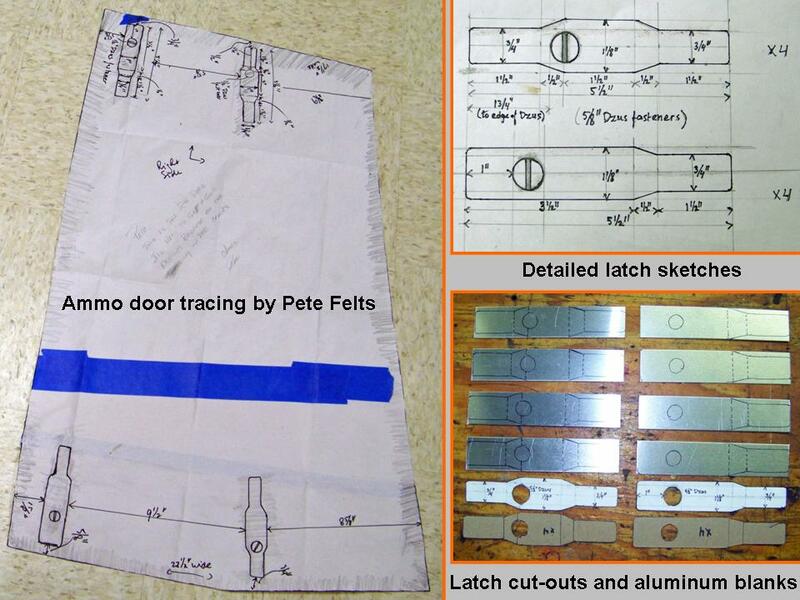 Figure 5, cell 03, shows the tracing and my detailed sketch of the latches, as well as the latch blanks I cut. 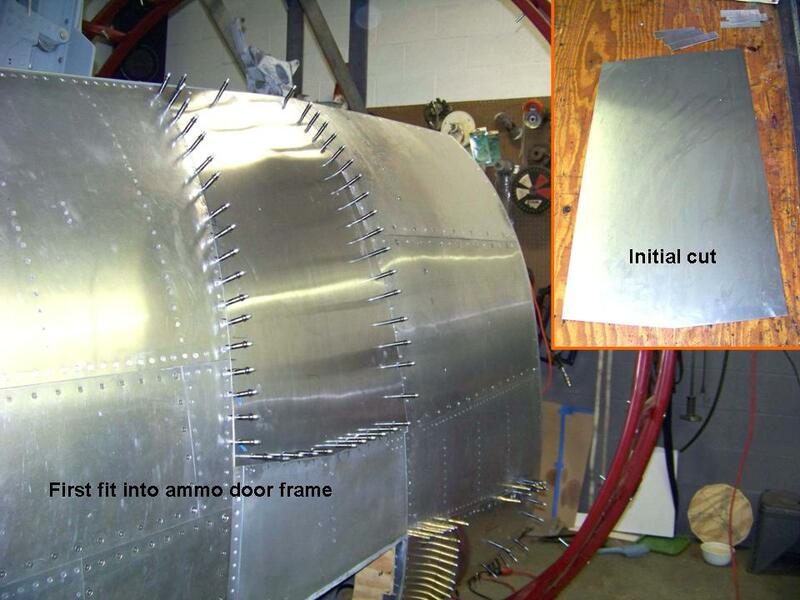 Figure 6, cell 01 shows the initial aluminum panel that was cut to fit the tracing and its initial fit on the ammo door frame in the fuselage. As you can tell by looking at the picture, the fit is perfect! At this point, I still have to cut the latch receptacles and I'll have to do a lot of detail work to make the ammo door look "real". 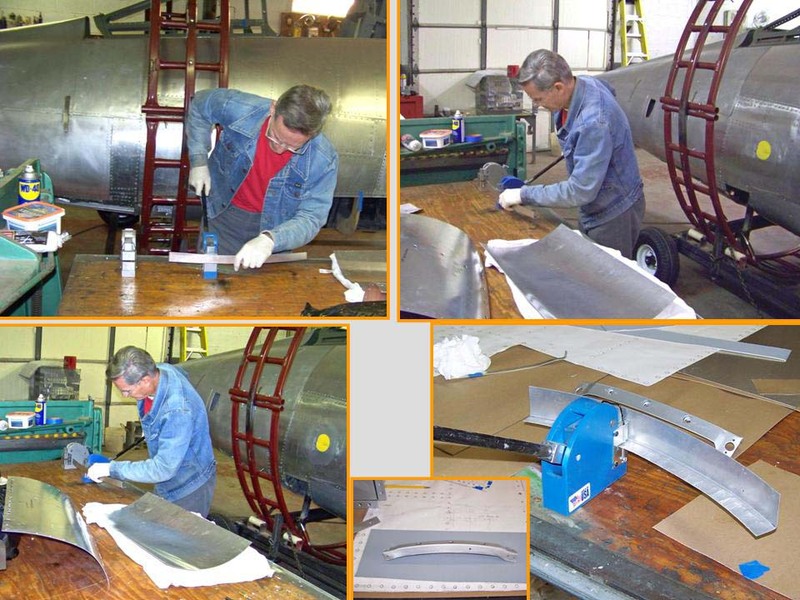 Cell 02 shows the F-100D fuselage after more than 2 1/2 years of work. (Yes, both sides are done ...) In the meantime, Steve continued to work on the display trailer. Cell 03 shows Steve after I interrupted him to take the picture. 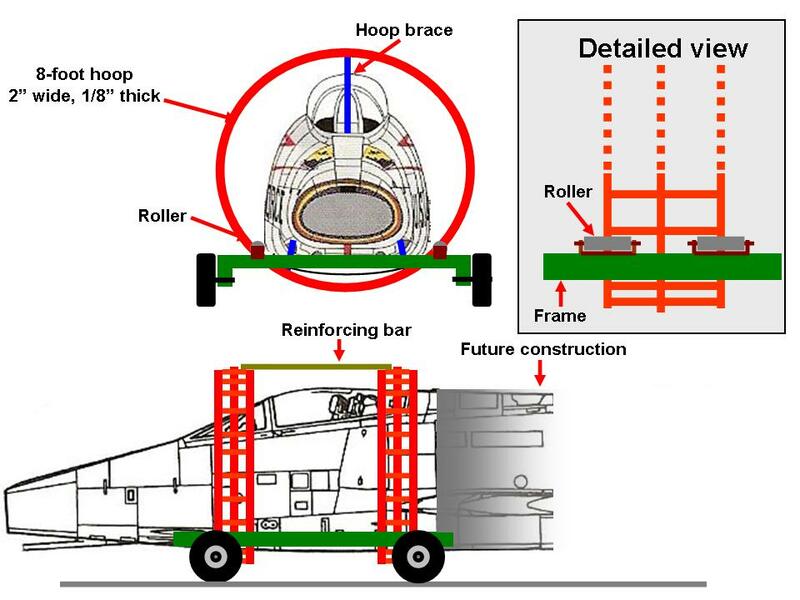 I suspect that some of the F-100 experts wouldn't care much for my frequent use of plywood ... but it sure makes the formers a lot simpler to make and it adds rigidity to the fuselage. Also, since none of the "doors" have anything behind them, none of the latches work and I'm just riveting everything together -- I'll cover the rivets with Bondo and paint where those rivets don't actually belong. The result of using such techniques will look like the real deal, so that's good enough for me ... and this fuselage will really be spectacular in a few years when it has that bright 56-3284 paint job!